Have you been claiming your free cupcakes? I know I haven't had a chance to and I'm pouting. There is something that puts a smile back on my face though and that's the new “Family Outing” clip from DreamWorks Pictures’ PEOPLE LIKE US, which will be on the big screens on June 29th. Mmm...I love seafood and I haven't eaten in a restaurant that does that in awhile. What, you ask? Watch the clip to see. This comedy-drama by Dreamworks pictures is rated PG-13 and has a run time of 115 minutes. 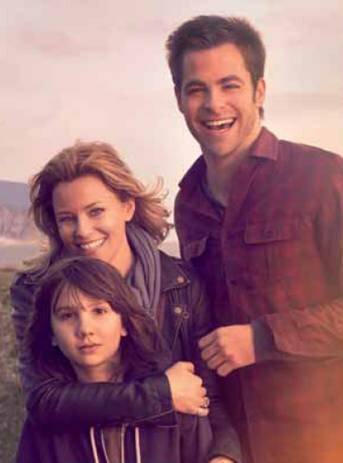 It also features a star-studded cast of Chris Pine, Elizabeth Banks, Olivia Wilde, Michael Hall D’Addario, Philip Baker Hall, Mark Duplass and Michelle Pfeiffer. Now, the SO and I love based on true stories and even those inspired by true events so this really works out for us. People Like Us is a movie inspired by true events and revolve around Sam, fast-talking salesman in his twenties who faces a life crisis when his latest deal collapses on the day he learns that his father suddenly passed. The story then goes on to reveal a tumultuous past, an estranged family and a dad's last wish. Will they be able to reconcile? What are your predictions? Will you be checking this one out? Ok so when it comes to movies I'm a documentary girl - but this looks like it could be really good. What a great cast, I will have to check this out! Awesome cast! Looks like it could be a great movie.